This is our old pallet pile. I haven’t even begun to collect them here yet. I just can’t help myself. 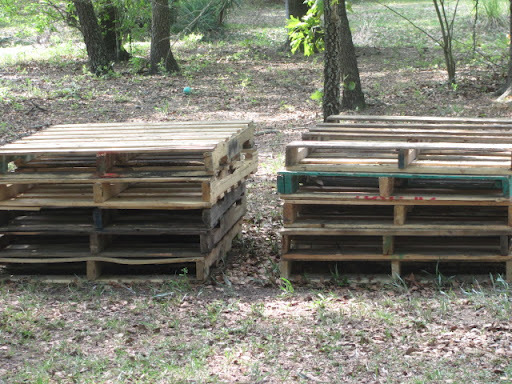 When I start cataloging things that we need I start thinking, “I could make that with a pallet.” So with the way things are going this are some of the things I am thinking of building with pallets. So just a few things. I am going try and sketch what I am envisioning and then hopefully they will scan in well. I am also looking at various paint chips. I want to use bold, bright colors. There is a terra cotta red in the living room and main hallway right now which I do love, however it just doesn’t seem to reflect enough light. One of the other things I need to do is acquire a sewing machine. I want to make curtains for each room. There is plenty of fabric to be found at thrift stores for that purpose. It would also be nice to make slip covers and some new cushions. HHmm…Maybe I should add pallet couch to the list and then make cushions for it. Pinterest with give you millions of ideas of what to do with them… hope you post some pictures! I love Pinterest and have gleaned many ideas from there. It will be a little bit before I can get to building. Still working the kinks out of juggling 2 jobs, 2 kids and re-starting the farm. LOL But I will definitely have photos as I create stuff.